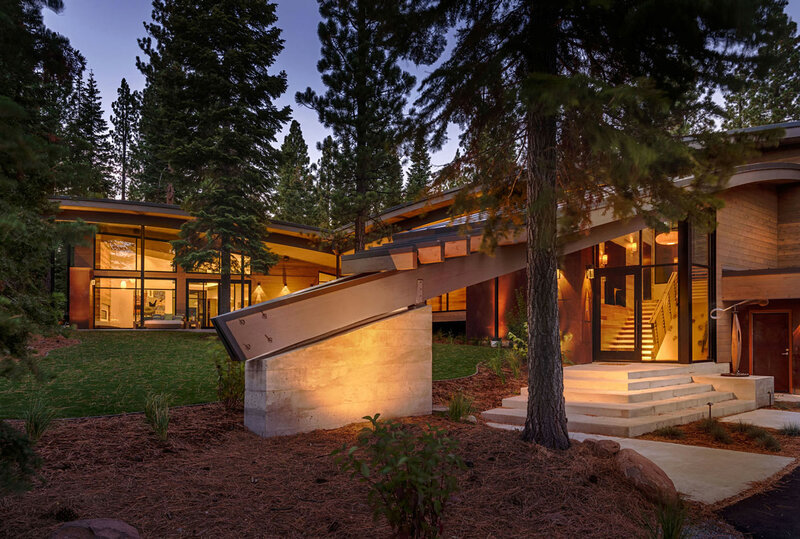 The Flight House was completed by the Sacramento based studio Sage Architecture. 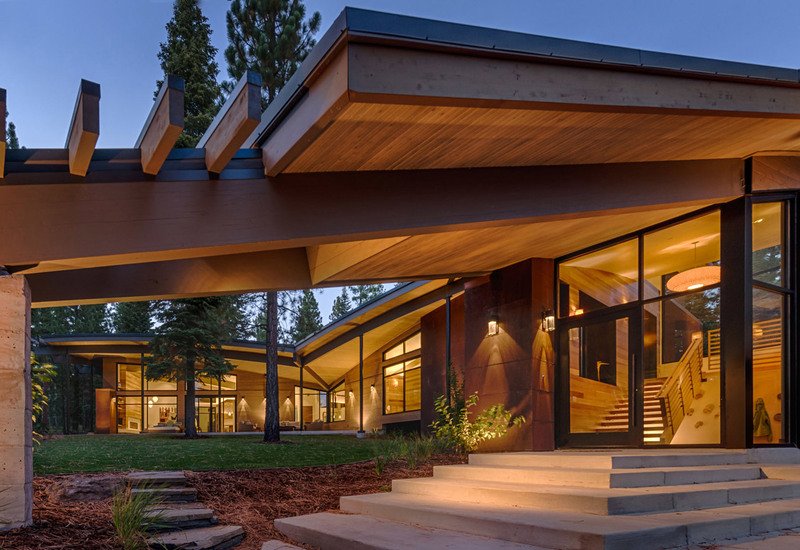 Set in the high Sierras, the house has been designed as a modern interpretation of a mountain home. 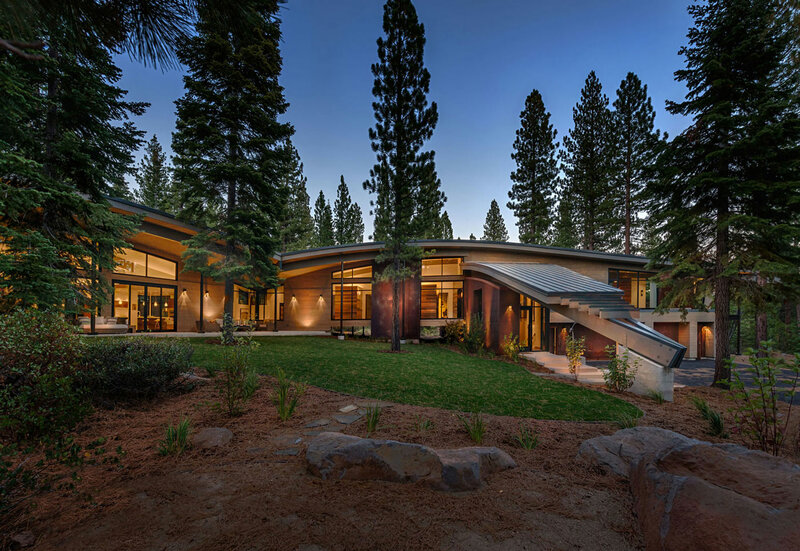 Flight House is located in the Martis Camp Development in Truckee, California, USA. 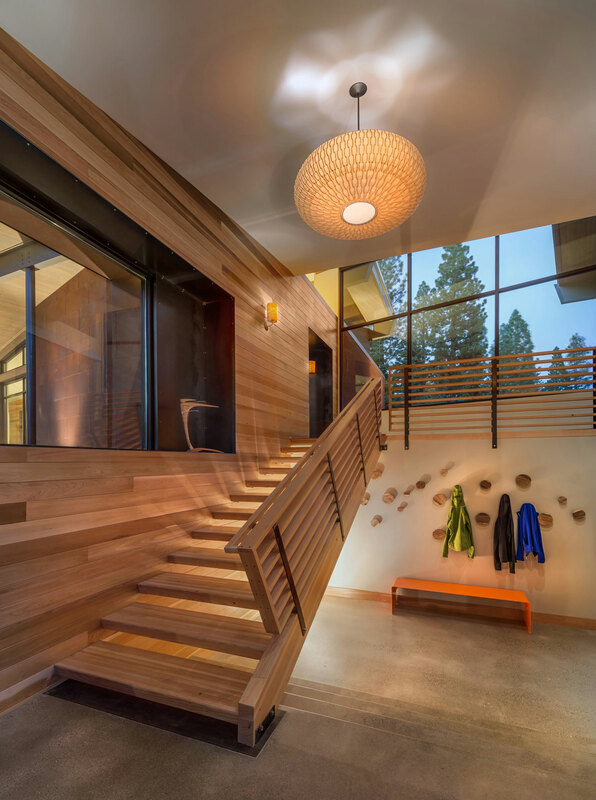 “The Flight House is a modern interpretation of a mountain home. 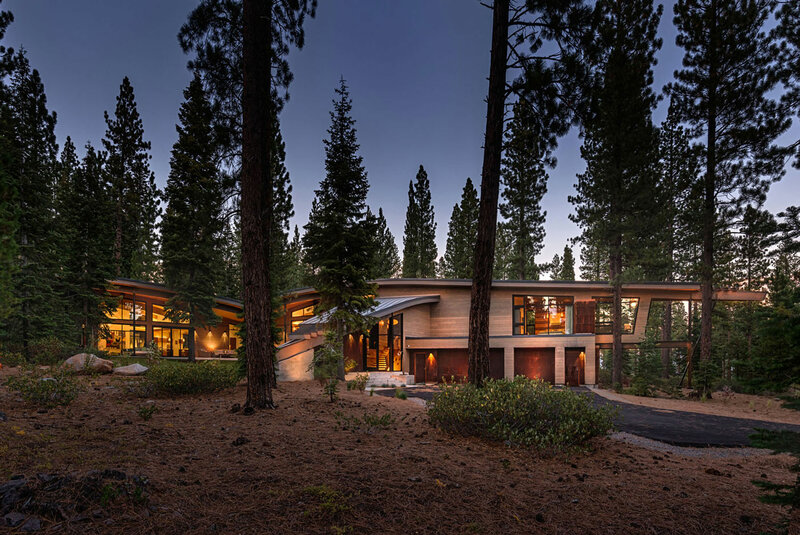 It is set in the Martis Camp development in the high Sierras. 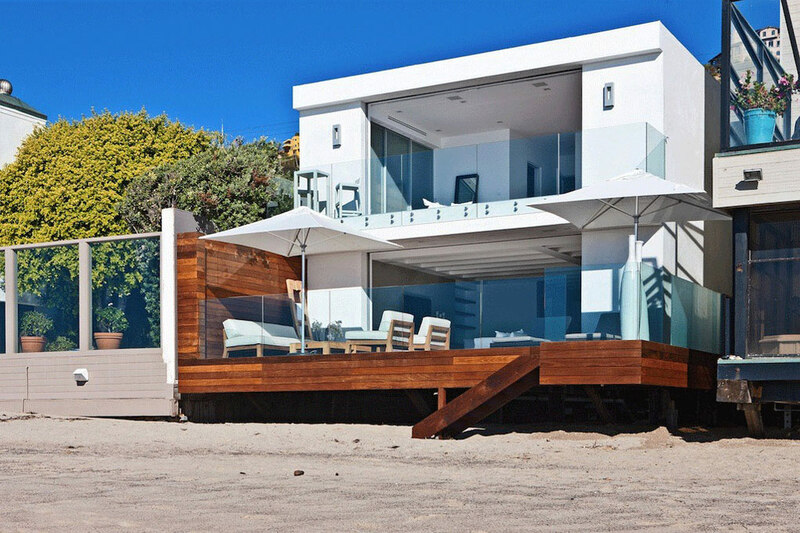 Our client were long-time lovers of modern architecture, with a particular affinity for midcentury modern design. This home was meant to be a place to get away from the city life, get back to nature, and “play together” as a family. 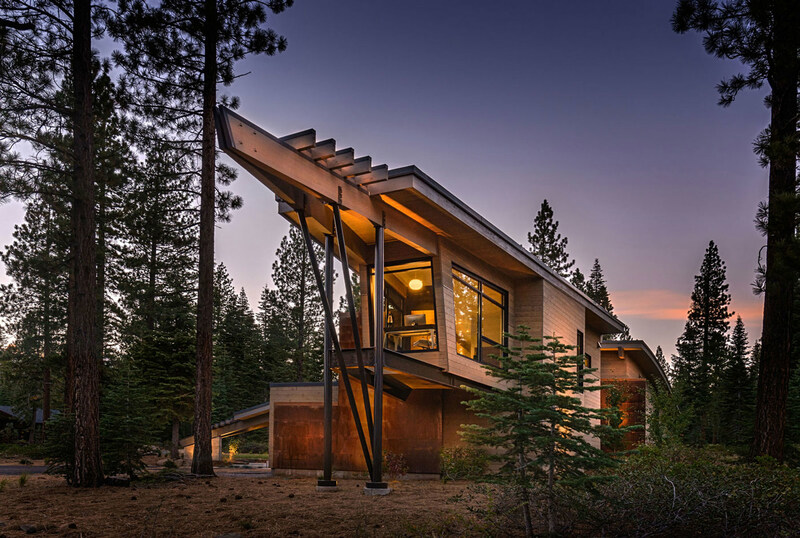 We named the home, “Flight House” to reflect the concept of escape but also because of the curving roof lines. 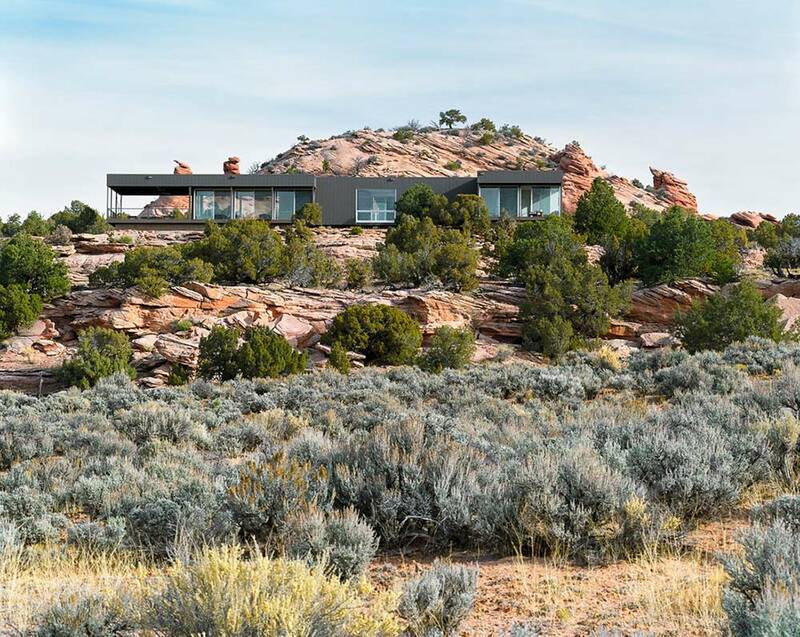 This is not your typical log cabin. 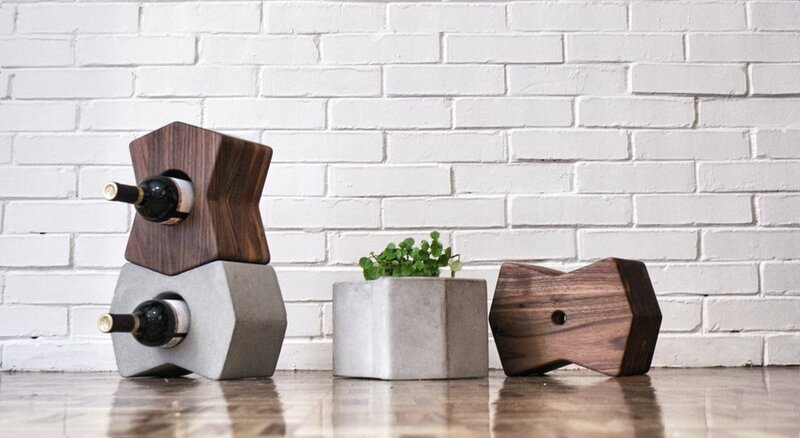 Nor is it your typical square edged box-like modern house or “A” frame. 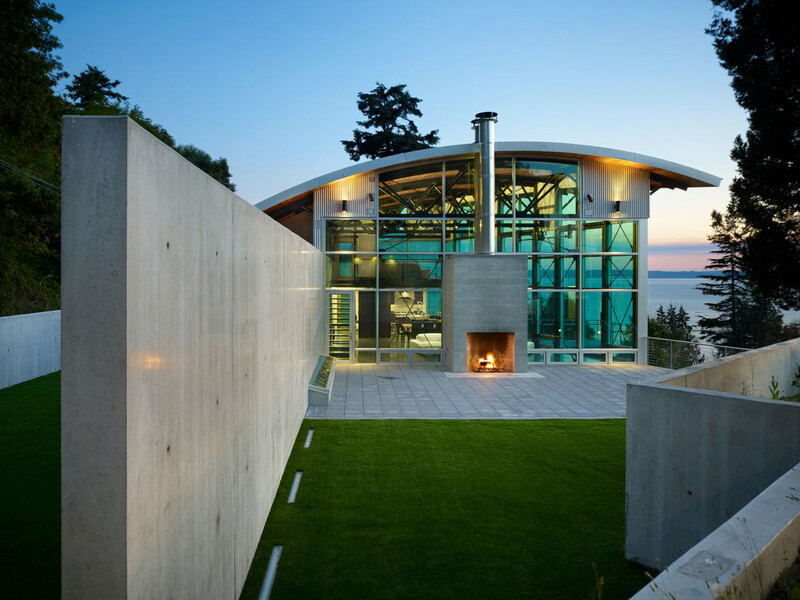 Instead, the home is graced by two large arching wing-shaped roofs to shelter the main living space and bedroom areas. 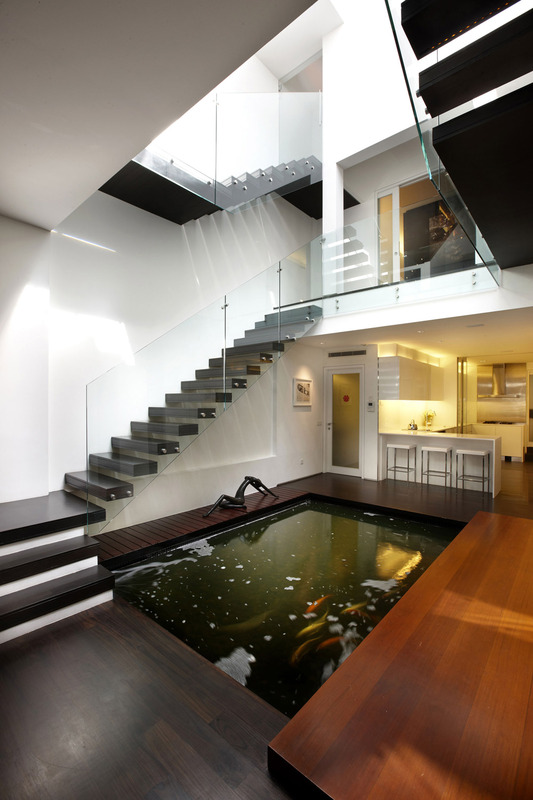 The two wings of the home offer very different experiences with the surrounding environment. 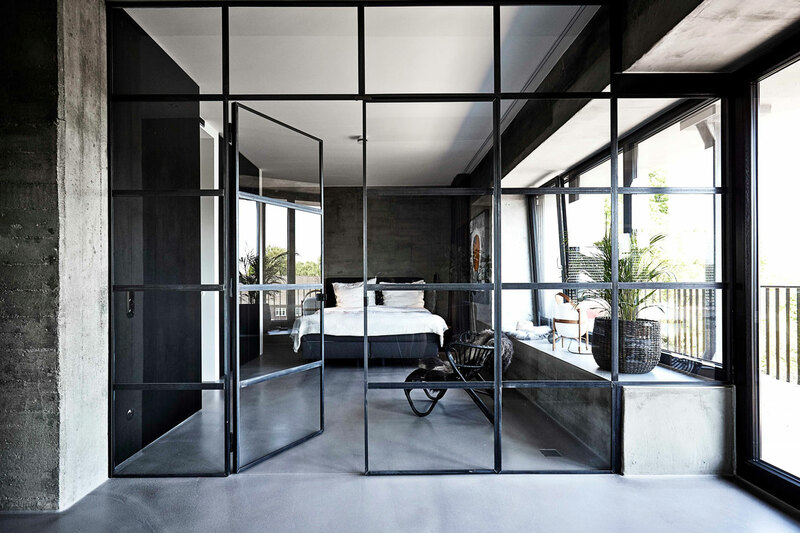 In the main living space, the great room is slab-on-grade with a polished concrete floor that extends to the outside and feels “grounded”. 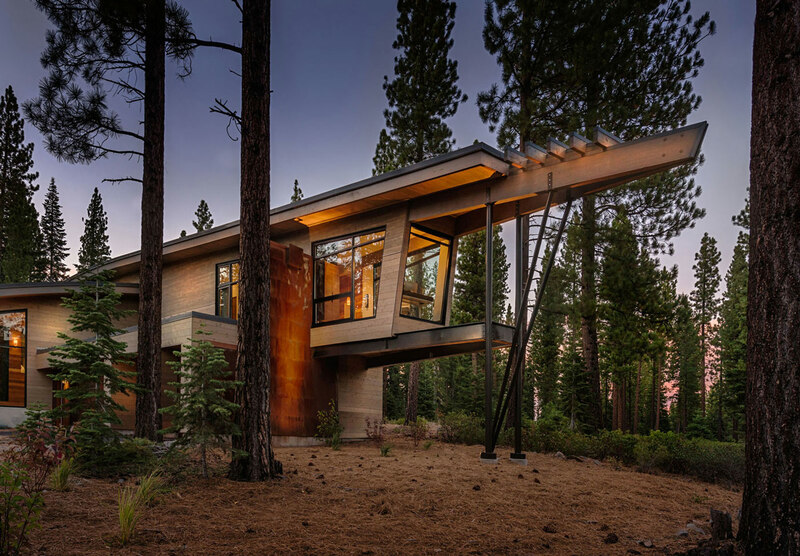 The bedroom wing “takes flight” off the land – as the terrain gently slopes down, the building gradually steps up, culminating in a floating 3-sided glass box in the master suite for a tree house experience. 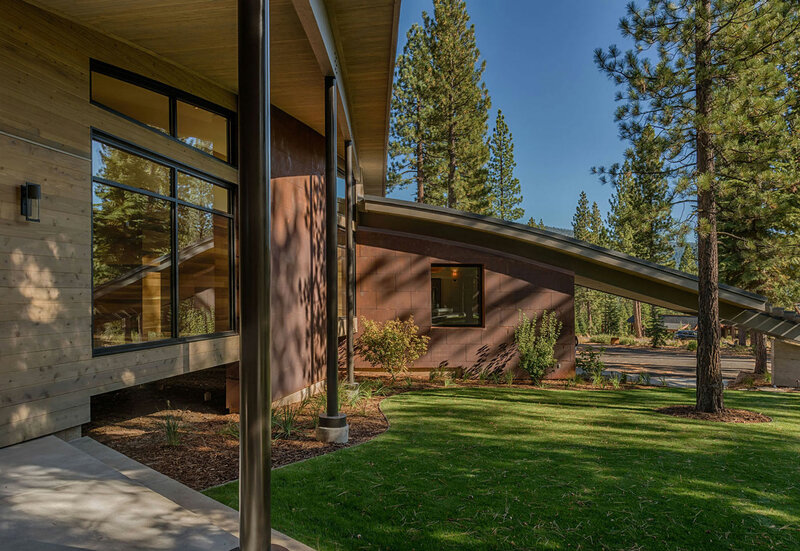 The entry to the home is defined by a third smaller curved roof structure, sheltering visitors and creating a softly defined separation between the outdoor courtyard space situated on the front, sunny exposure side of the home and the street beyond. All the roof structures are created with huge curved glu-lam beams. Because we place a large emphasis on passive solar design in our homes, the exterior gathering space wanted to be on the front side of the house to gain the best southern exposure. 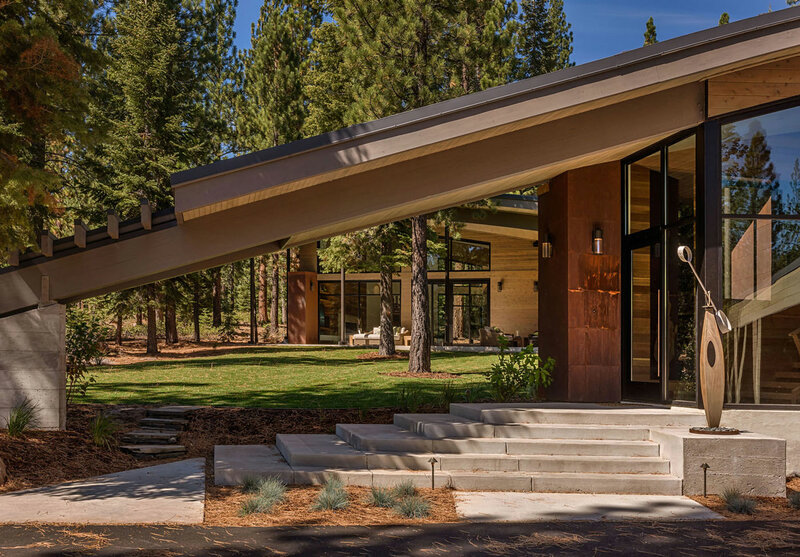 A deep overhang at the main gathering space creates a second protected outdoor gathering space, while shielding the home from the hotter summer sun. 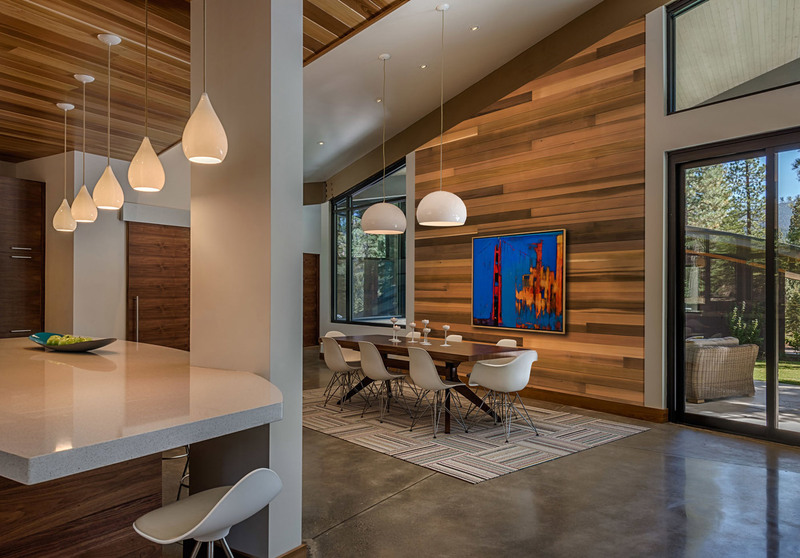 In the winter, when the sun dips lower in the sky, the sun penetrates into the inner spaces and with the polished concrete floor acting as a heat sink, absorbs this natural heat to warm the space. Overall, the home is heated with energy efficient radiant flooring. And there is no air conditioning. 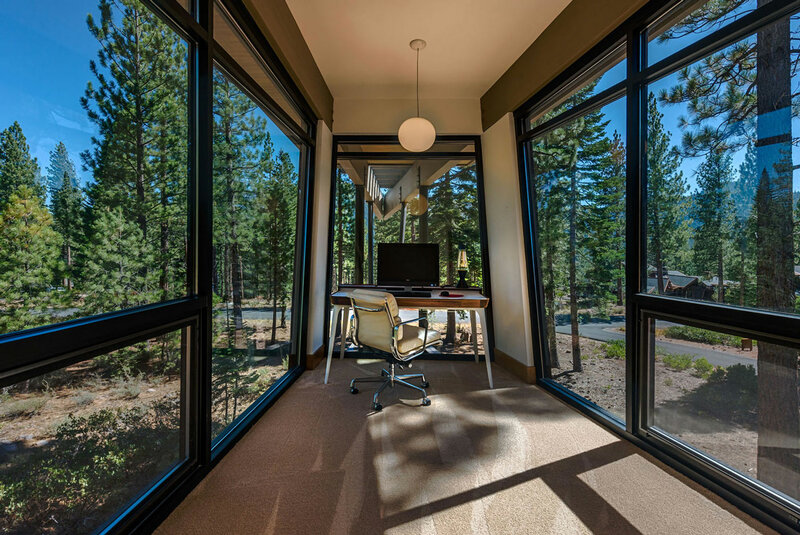 Instead, windows are strategically placed to allow cross ventilation through spaces for natural breezes. 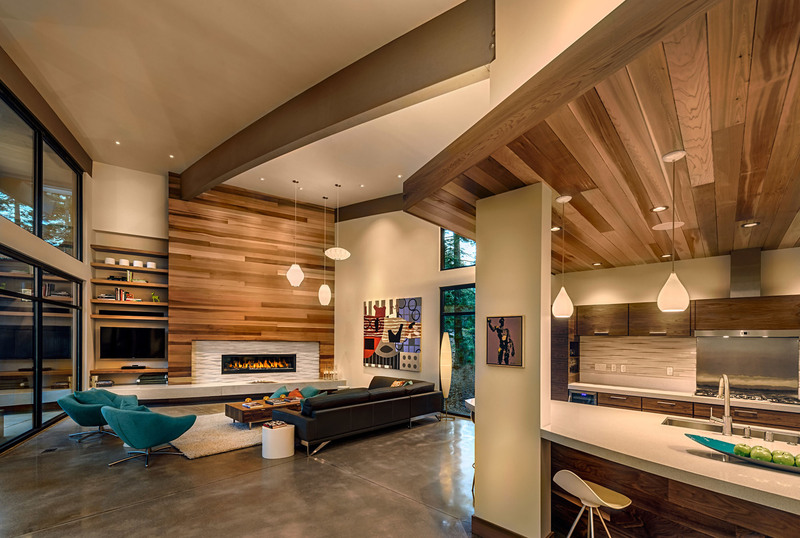 Inside the home, spaces are left clean and unadorned to emphasize the sweeping curve of the roof when possible. 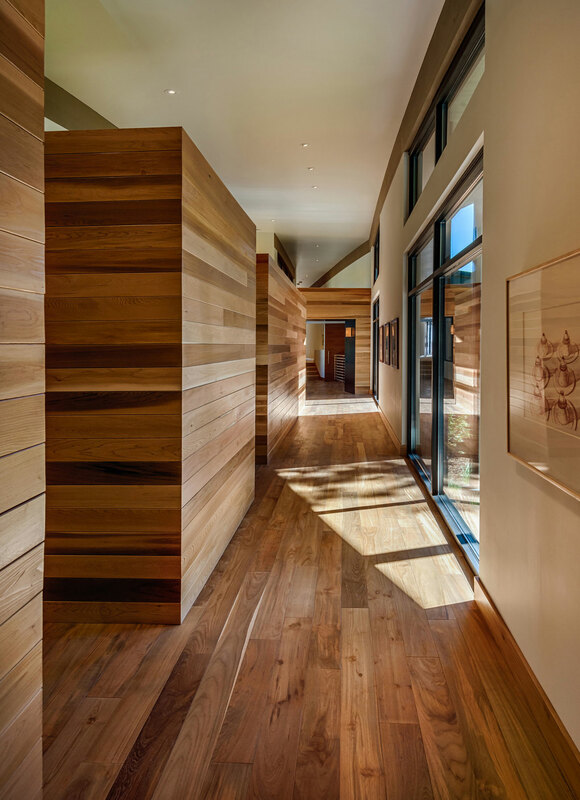 As visitors travel down the gallery hall to the main living space, a series of cedar-clad boxes sit within the larger space where the glu-lam beams rise above. 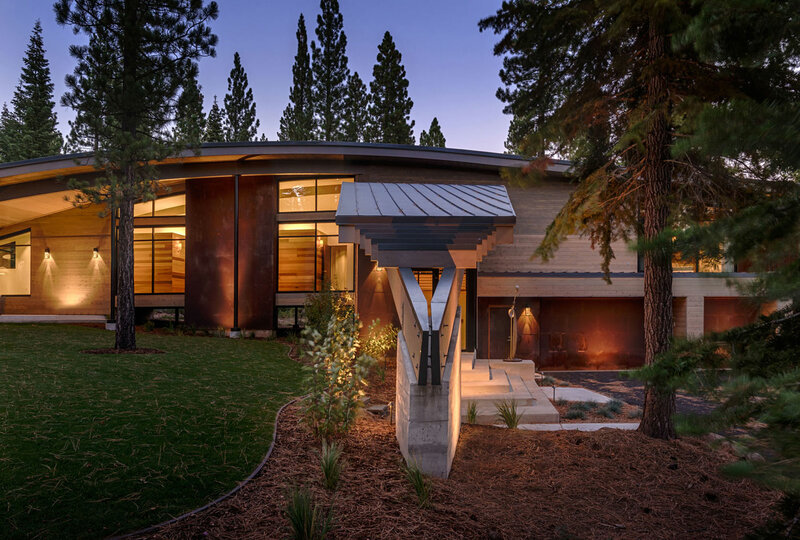 In terms of materials, the exterior is clad in stained cedar siding and Corten steel. An emphasis was placed on low maintenance materials. The roof is a combination of standing seamed metal roofing where visible, but the majority of the home’s roof is actually a single ply membrane “cool roof” for better energy efficiency in the warmer summer months. 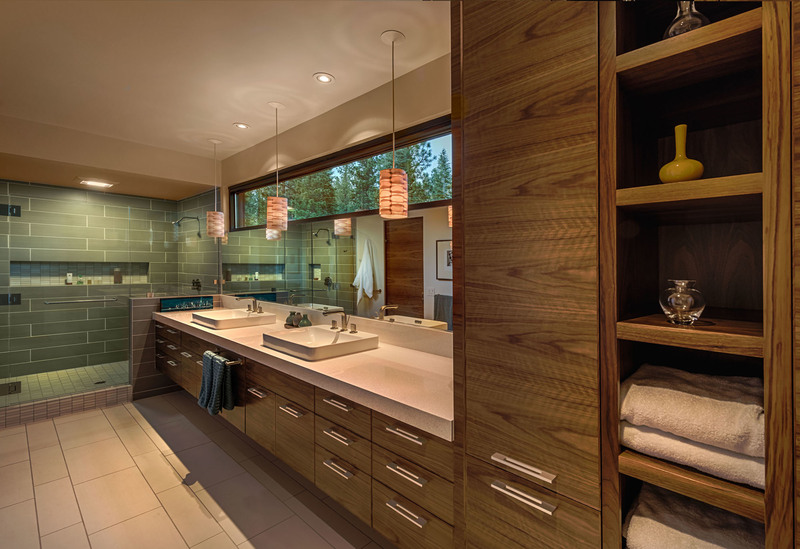 We selected a muted natural palette for the interior spaces, using woods in their natural colorations with no tinting or stains. 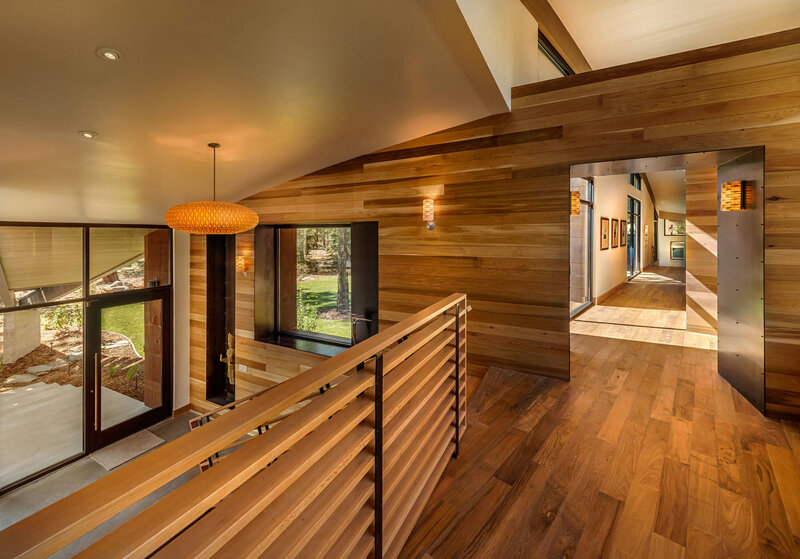 The floors in the elevated wing of the house are sustainably harvested teak. 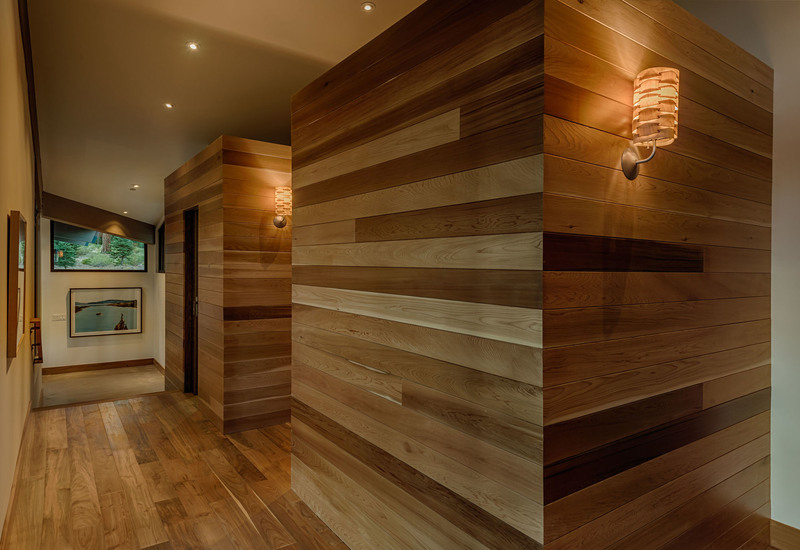 Walls and ceilings are clad in cedar. 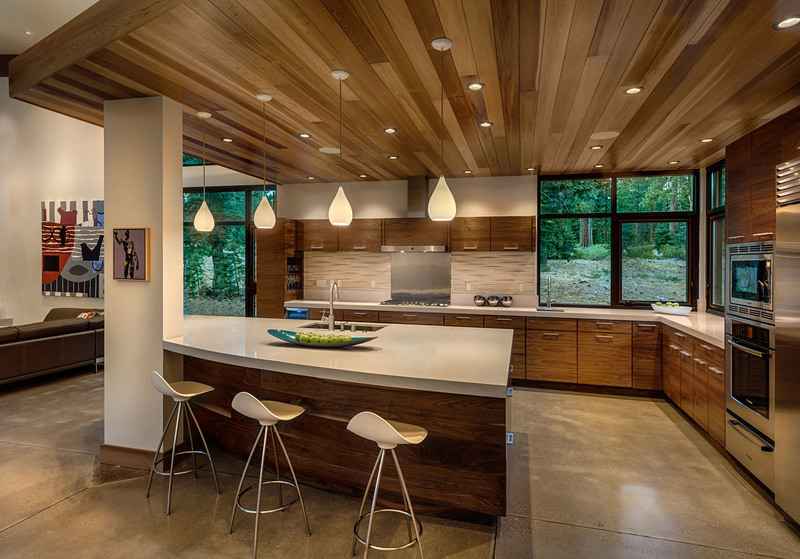 And all cabinetry throughout is walnut. Other wall surfaces were painted a crisp white to function as gallery space for our clients’ art collection. 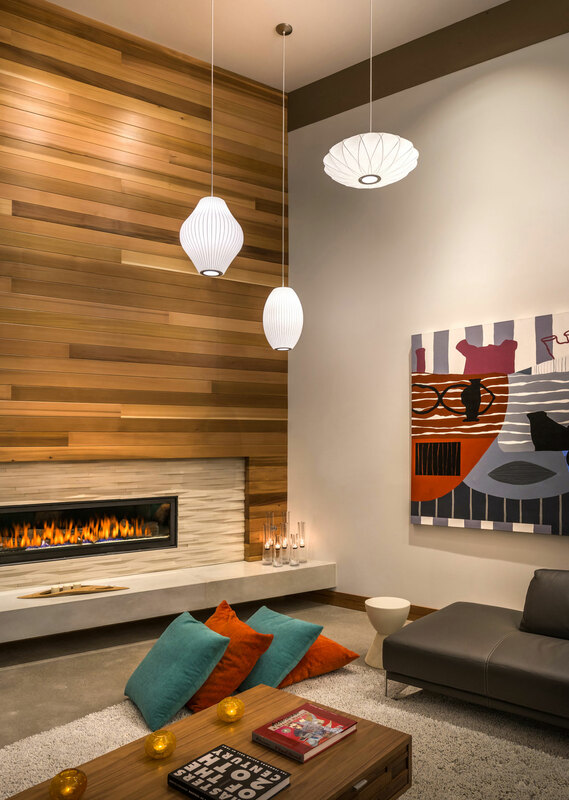 Light fixtures and tile products were all selected and placed to emphasize the long horizontal lines of the building and to pick up the mid-century modern vibe our clients loved.